I had a boyfriend a few years ago. We started off the relationship with me pursuing him while he kept a distance, and ended the relationship two years later, with him pursuing me while I kept a distance. Unfortunately, this dynamic was way too familiar to me. I was willing to accommodate and contort myself to what I thought he wanted me to be until, one day, I switched. My tolerance dropped. I became boundaried, stern, judgmental, and cold. No fun. Since that break up, I have been increasingly fascinated by the relational dance between humans—not only romantic, but also with family, friends, or even the stranger I bump into as we both try to get what we want out of the New Seasons salad bar. You’ve been there, right? Why, on some days, do I feel open to connection and some days I don’t? On some days I walk into New Seasons with a smiling undercurrent to my presence—light-footed, and willing to share chit-chat with the other shoppers and employees, while other days I want to be invisible, earbuds in, gaze down, with a get-in-get-out and don’t get in my way attitude. LOTS of reasons, I’m sure; blood sugar, hormones, mood, “I’m an introvert,” the current happenings of my personal life, how my day is going, exhaustion, just to name a few. Still, something persists through time. Something persists in the me that was willing to pursue, pursue, pursue, and bend to the preferences of that past boyfriend, and then push him away once I had his love. Something persists when my amazing mom, whom I love so dearly, comes to visit, and within 24 hours I’m pushing her away with criticism and coldness. Something persists in my claim towards being an introvert; preferring to turn in, rather than turn out. This something is nuanced and beyond labels. This something is the me that learned how to relate, the me that first made eye contact, the me that could relax and feel safe at times, and the me that was scared at times, too. Except I didn’t know if I was scared or safe or had any capacity to reason about it. This me was tiny and without a sense of Self or other. They were one and the same. A sense of Self develops over time. I was watching the new Planet Earth II (on Netflix, highly recommend) and there was a section about Iguanas. These particular iguanas lay their eggs in the sand and the adults go sunbathe on the other side of the island. When the eggs hatch, the baby iguanas pop their heads out and peak around. They slowly emerge only to be greeted by dozens of snakes that are ready for their biggest meal of the year. Somehow, these baby, freshly-born iguanas not only have fully functioning bodies but they also somehow know which direction to run toward the adults. Within moments of being born, snakes are chasing after them, and they are running for their lives. They are born into this world ready to run, jump, eat, and navigate. Humans, on the other hand, are born defenseless. Unless we have a caring person (people) providing for ALL of our needs, we will die. When was the last time that you held or witnessed a newborn? The only “defenses” (i.e. asking for needs to be met), a human baby has are to (1) cry, and (2) get you to fall in love with them so that you are motivated to care for them. I’ve been taking some time with this and I invite you to as well. Imagine being completely helpless, embodying an infant, with no sense of Self or separateness. That loud noise you just heard IS you. The chaos/calm inside or between your parents IS you. There is no separation. We were all THAT helpless and dependent at the beginning. To need people and depend upon them is not weak; it’s healthily human and persists as a basic survival (thrivival) need throughout our lives. So, my friends, TRUST that your need for connection is inherent, natural, and a sign of health. Understand that within you still remains your formless Self that needs to be held and cared for and to be told “Everything is going to be ok.” Yes, we have more resources now as adults. We can run from the snakes and build our own salad, but we still need each other to truly know security deep in our nervous systems, residing in every cell of our bodies. That’s the good stuff. How do we do that? How do we get connection? Sustain relationship? Share intimacy? Navigate our own versions of push-pull in relationships? Practice. We are offering many opportunities to practice and hope you will join us! 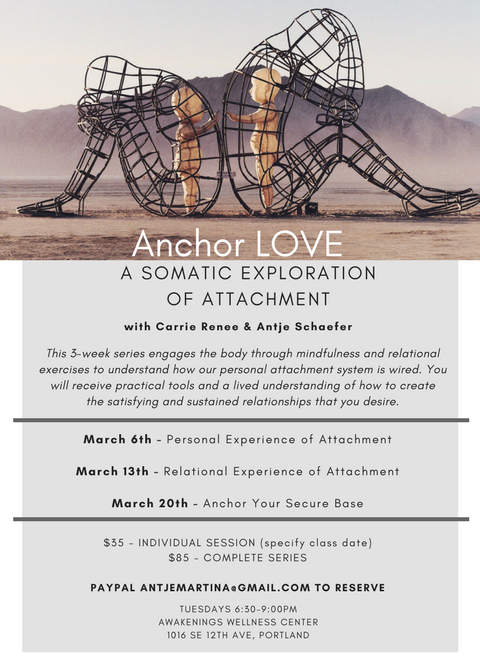 My latest offering, Anchor LOVE, is a 3-week series dedicated to unlocking the root relational imprints we received from the beginning. All of these practices will bring clarity to your relational tendencies. With clarity, more choice arises. When more choice is available, we can boldly move toward the life and relationships that we truly desire.